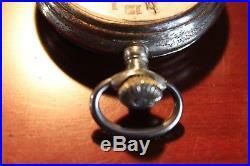 A Real Cool 8-Day Pocket Watch with Issue….. This is a Nice Hebdomas, 7 Jewel, Swiss made, 8 Day movement, c. I have been bench testing This watch for Several Weeks and Discovered that when it is moved it Stops. 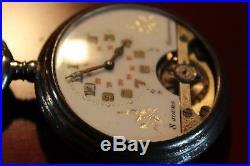 SO, it will need checked out by a qualified watchmaker or repairman. When on the bench, it keeps Perfect TIme. 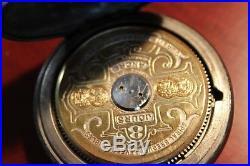 It has a NIce white 24-hour dial with gold leaf and open balance at the bottom. 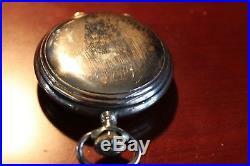 Nice case, steel with a little surface rust. This has an open-face hunting case. 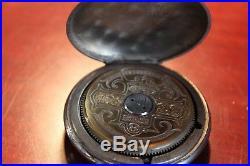 Cover over movement is gold and the cover states 8 hours – spiral breguet levees visibles. Has four trademarks of Chicago 1902, Geneva 1896., Milan 1916, and Paris 1900, Anore, Bruxelles 1910. At bottom signed Qualite, Superleure Garantie. Watch winds good and will run a good two weeks plus on one winding. 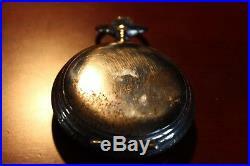 A Very NIce Rare Pocket watch. This will be Nice, once Restored. Feel Free to ask any questions you have about this Neat Watch. I will try to reply ASAP. ATTENTION: We have just REDUCED our Pricing on this item to Move it along. The Dial is Very near Mint, inside looks good. Please see my description and photos for more Details. It may just need a cleaning and or Service. The balance runs free but is not consistent. 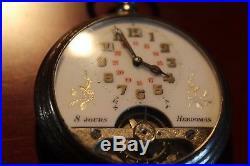 Eight Day Movements are very hard to find in a Pocket Watch. Good Luck and Thanks. 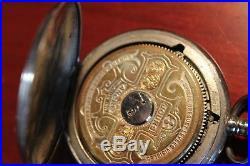 The item “REDUCED, HEBDOMAS C. 1910, 7 J, SWISS 8-DAY, Pocket Watch Open Face Hunting Case” is in sale since Tuesday, February 20, 2018. 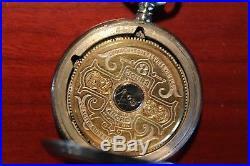 This item is in the category “Jewelry & Watches\Watches, Parts & Accessories\Pocket Watches\Other Pocket Watches”. 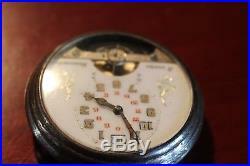 The seller is “grandfatherclock44″ and is located in Wooster, Ohio. This item can be shipped to United States, Canada, United Kingdom, Denmark, Romania, Slovakia, Bulgaria, Czech republic, Finland, Hungary, Latvia, Lithuania, Malta, Estonia, Australia, Greece, Portugal, Cyprus, Slovenia, Japan, China, Sweden, South Korea, Indonesia, Taiwan, Thailand, Belgium, France, Hong Kong, Ireland, Netherlands, Poland, Spain, Italy, Germany, Austria, Israel, Mexico, New Zealand, Philippines, Singapore, Norway, Saudi arabia, Ukraine, United arab emirates, Qatar, Kuwait, Bahrain, Croatia, Malaysia, Chile, Colombia, Costa rica, Panama, Trinidad and tobago, Guatemala, El salvador, Honduras, Jamaica.